As Karmarie developed through his younger years, certain abilities would always stick out to him – one such ability is photokinesis. Always favoring the stealthy approach in contrast to simply walking up and engaging the opposition, Karmarie has dedicated much of his training to abilities that can supplement this goal. With a light foot and quick reflexes, leaning towards the field of augmentation, Karmarie is able to remain undetected even in the face of the most professional and aware people. However, for those situations that don’t always go quite as planned, Karmarie has an out. Though no master with words, he can always rely on his lightsaber should it be required – no pushover in combat, he is considered a formidable foe to be trifled with. By mixing conventional Jedi training with the vigorous regimen that he came to know as a Matukai, he possesses such abilities as tutaminis, extremely capable in the field, he is able to absorb and negate the impact of blaster shots, as well as slashing and blunt damages, also his level of Tapas was higher then most, being able to protect himself against extreme environments, additionally he would be able to emit heat up to the level of melting or setting ablaze to objects. This being a result of his Matukai heritage. Even when his barrier fails, he can fall back to his training in healing and his ability to boundlessly rejuvenate his stamina pool. Karmarie is a paramount example of what a cross between a stealthy operative and an expert combatant can achieve. Jedi Knight, Jedi Ace, and Gate Master – Karmarie Zar is commonly characterized by his physical abilities and levity, and yet is known for his severe seriousness and focus in dire situations or when instructing topics of importance. Best known for his participation in the Battle of Lorrd during the Imperium War, Master Zar as a Padawan Learner, reportedly, brought down an Imperium walker with his lightsaber, when his allies needed it most. Known to be both incredibly charming and handsome, Karmarie Zar is no pushover on the battlefield. He is widely accepted to be an excellent swordsman and pilot, fashioning a double-bladed lightsaber – a rarity in and of itself. The Jedi Knight is knowledgeable in many a form (Form IV – Ataru, being his favored form) and weapon, and thus has contributed his skills to the defense of the Rannon Praxeum, the Jedi Order, and the Galaxy at wide. Karmarie Zar was born on the grassy plains of Naboo in 327.03 ABY, his family re-sited on the outskirts of the capital city, Theed. His father, Cerone Zar was an engineer for the Naboo Royal Space Fighter Corps, and worked closely with Naboo’s most known star fighter, the N-1 series. His mother, Aria Zar however took the calmer route and carried on her family’s business which her mother and father had passed down to her, changing the original name from “Daw’s exotic flower shop”, to “Zar’s exotic flower shop”. During Karmarie Zar’s early years of being born it was quickly noticed how up spirited the boy was. He always had a smile on his face, no matter where he went, he hardly ever cried. Like a light in the dark abyss, he shined bright covering all darkness. He was also known for being a very hyper active baby, reason for his father claiming he could walk before he could crawl. Due to the fact that Karmarie’s parents, Aria and Cerone Zar had quite decent paying jobs, Karmarie was able to go to get a good education at one of the best schools in Theed. However during his time at the school in Theed he was bullied quite a lot, changing his whole opinion on his education he began to slack on his work. He couldn’t take it, a young eight year old Karm couldn’t take it, his light of happiness was not bright enough to shine over all the darkness he was surrounded by, at this point he had asked his mother and his father, both if he could be home schooled. However they didn’t allow Karmarie to be home schooled as they were barely able to pay for the school in Theed, and the amount for a personal tutor is double the price of the school in Theed. Karmarie didn’t take his parents’ request lightly, he isolated himself everybody at school, there were times where he wouldn’t say one thing to his parents. Two years later, Karmarie would be at the age of ten and it was his last year of school before heading into the junior’s section of the school, where all the big kids were. He still isolated himself from everyone but he was slightly more sociable. He was now able to put up his hand during class to answer a question, or speak to someone, but he still was missing one thing. A friend, but he was in luck because he had met a Zeltron by the name of Tycho Fitzim, Tycho had moved to Naboo from Zeltros due to the fact his mother wanting to move somewhere closer to his father’s ‘work’ and Naboo was the only cheap option. Karmarie and Tycho were best friends they spent a lot of time together, they often played tag and raced each other across the plains. A year of happiness, Karmarie began to speak up more and more as the cycles went by, he even asked his mother if he could help her out with the family business. Life was going great, his light of happiness was shining brighter than ever before, and who would of known he could shine even brighter. As Karmarie and Tycho grew closer they visited each other’s houses more. One day however, Karmarie visited Tycho’s house, they played games with each other like any normal boys, they headed outside into the garden, and were met by a mysterious thing, at the back of the garden lied a shed, however the two boys had never seen this shed before, like it was built over night. Karmarie had asked Tycho if he had seen the shed yesterday. But Tycho responded with a no. The two boys opened the wooden shed however there was nothing inside, they were just about to leave however a secret passage opened up in the ground, and it had a small set of stairs leading down what looked to be a room. They boys slowly creped down the stairs, finding Tycho’s father floating in a meditating position in mid-air, his eyes were closed facing towards the boys, there was also a shiny metal stick floating with him, bobbing up and down in the air. His deep monotone voice spoke “I knew you boys would come down here one day, it’s good, I think I can finally show you” he slowly descended touching the ground, he slowly got up guiding his a brown robes towards him, Karmarie and Tycho’s mouth were wide open, they couldn’t believe what they had just saw. Tycho’s father had identified himself as Jedi Master Raynar Fitzim, he’d retired from the order wanting to create his own family, not knowing his son and his best friend would be force sensitives. The next day Master Fitzim had visited Karmarie’s parents’ house and had given the news that there son was a force sensitive and he would be training at the Ossus jedi temple, they couldn’t believe it. 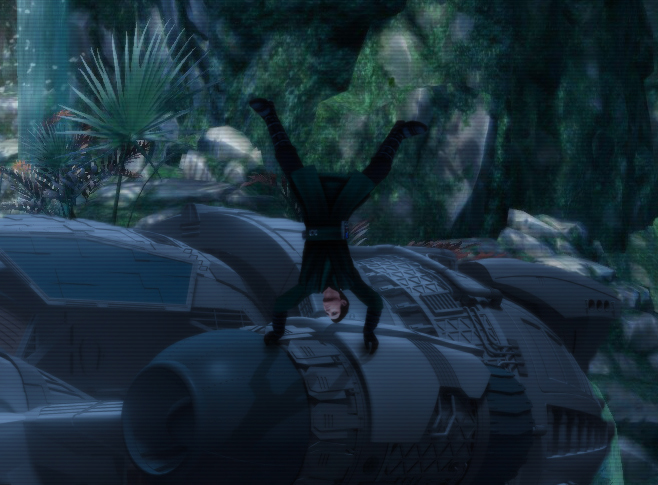 There was no denying it, they were really happy for Karmarie, so later that day Master Fitzim had set up a transport for both Tycho and Karmarie to the Ossus temple though when Karmarie arrived he was transferred to the Yavin IV temple due to Ossus temple being overpopulated. However Tyhco and Karmarie still keep in touch. After 2 years of training at the Yavin IV Temple, Karmarie had been chosen by the Yavin IV Council to complete his Initiate trials. He passed, progressing onto the rank Novice Padawan. Karmarie now started to display a clear love for augmentation, making it one of his primary focuses. He developed a firm understanding of lightsaber arts during the time. Not even a year later Karmarie found himself being taken on as a Padawan Learner by Matukai Jedi Master, Arven Silaan, a Matukai transfer who had been with the branch during their time on Alzoc III. Only after a couple years of training Karmarie was already shaping to be a great combatant. Karmarie opted to join the Guards as the department best suited him along that the hangar maintenance crew as well. He adopted to the role quite well due to his combative training under Arven Silaan and his overall love for ships and flying, and to this day now is the current Gate Master of the department. Coming to the end of the Imperium Wars Arven Silaan decided to separate with Karmarie as the Imperium Wars had affected him to an extent that even surprised himself. With that Karmarie was Masterless. He asked the council to help but even with there advice he still wasn’t motivated. Though out of nowhere Master Dan’kor decided to see Karmarie’s training to the end, which he did. Master Dan’kor was a transfer who had been with the branch for a considerable amount of time, not only that but was also a High Councilor to the Order and Master Archivist to the Rannon Branch. His training with Karmarie was a lot more force orientated compared to Arven Silaan though he did note that Karmarie was lacking in the force area of his training in which he was able to balance his training out. Years down the line as there training went on Karmarie had faced his trials to become a Jedi Knight which he passed along Duncan Therin. With that they were both announced as Jedi Knights of the Order. Karmarie found the transition to the life of a Jedi Knight quite smooth, a year down the line becoming the Gate Master and taking on his first student, Kargaa Tyrus, a Mirialan. 323.03 ABY – Karmarie Zar is born on Naboo. 336.21 ABY – Karmarie Zar is initiated by the Yavin Council. 338.18 ABY – Karmarie Zar is promoted to Novice Padawan. 339.10 ABY – Karmarie Zar is apprenticed to Arven Silaan. 346.19 ABY – Karmarie Zar is apprenticed to Cael Dan’kor. 354.24 ABY – Karmarie Zar is promoted to the rank of Jedi Knight. 355.24 ABY – Kargaa Tyrus is apprenticed to Karmarie Zar.